Kishore Bharati Pujabarshiki 1420 is Monthly Edition of Kishore Bharati Magazine. 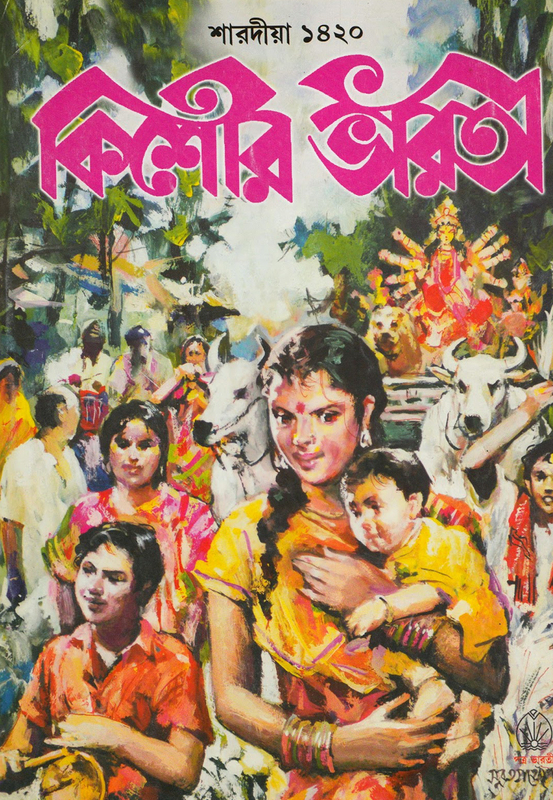 Kishore Bharati is a popular Indian Bengali Magazine fore Juvenile and Teenagers. The Magazine "Kishore Bharati" has started its publication since 1968 associated with Patra Bharati. On August 3, 1981, Patra Bharati stepped into the field of book publishing with a view to create a kind of readership who care for honesty, value and rationality. All the top authors like Ashapurna Devi, Premendra Mitra, Bonophool, Narayan Gangopadhyay and renowned artists like Mayukh Chowdhury, Narayan Debnath, Shailya Chakraborty contributed to the magazine from the start. Down the years, all the top ranking and most popular authors from Bengal, like Sunil Gangopadhyay, Shirshendu Mukhopadhyay, Sanjeeb Chattopadhyay, Samares Mazumdar, Suchitra Bhattacharya have been associated with Kishore Bharati. It was first published in 1986 from house of ABP, the biggest media conglomerate in Eastern India. This edition cover story is Sarodia Pujabarrshki 1420 Edition. Other Articles are Special Edition, Fashion Tips: Different types of Sharees, Beauty of skin etc. Download Kishore Bharati Bangla Magazine pdf and Read Kishore Bharati Magazine Pujabarshiki 1420.